Veeam will soon release version 9.5 of Veeam Backup & Replication. In this blog post, I would like to share some of the new capabilities that 9.5 delivers with our NetApp ONTAP storage integration. As this is not a major version release, we didn’t add any specific new features, however, there are several improvements with respect towards backup resource scalability, which is of particular importance in enterprise data center environments. With 9.5, we implemented an advanced way for the Veeam backup server to identify the correct Data LIF for the backup process. In the above example, the VM is stored on an aggregate located on Node 4. With 9.5, we made sure that data LIF4, of node 4, is used to access and backup the VM, instead of using data LIF1 on node 1 and transferring the data over the back-end cluster network. With this new implementation, we avoid the potential for node 1, or the back-end cluster network, to run out of resources during a Veeam backup. 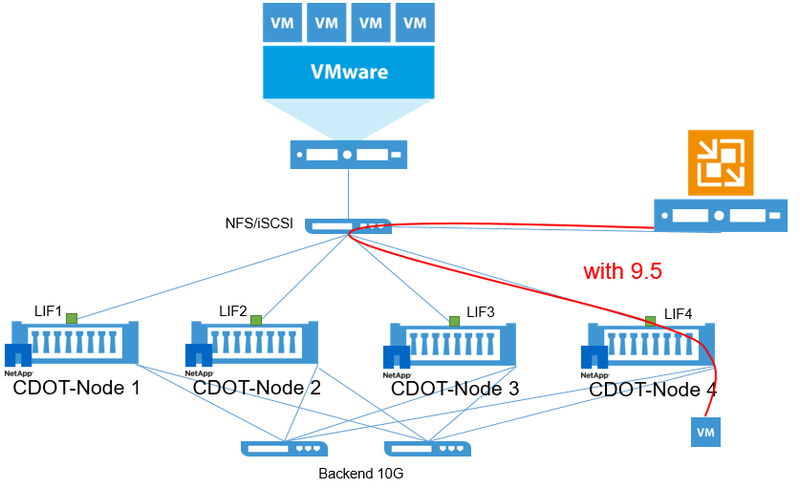 The new cluster aware LIF selection also follows the data in case it is moved to another aggregate on another node, thereby ensuring the optimized path is utilized by the Veeam proxy server to perform data movement. This functionality is enabled by default and does not require any action from your side to utilize this new capability. The second enhancement is a new way to define proxy affinity between your NetApp ONTAP systems and the Veeam proxy server. By using proxy affinity rules, you can easily define Veeam proxy server assignments for each NetApp ONTAP system. If there are multiple NetApp systems and Veeam proxy servers in the same environment, it is recommended to assign affinity relationships to avoid situations where a Veeam proxy server is misaligned with an ONTAP system. This capability saves time in the job initialization process and optimizes proxy resource utilization in larger environments, enabling you to ensure that specific proxy servers are available for specific backup jobs. This also ensures that local proxies are only accessing local NetApp ONTAP systems when using network based access protocols like NFS or iSCSI. To configure the proxy affinity, simply go to “Storage Infrastructure” within your Veeam Backup & Replication console and select the NetApp cluster you want to modify. Open the advanced settings and select the backup proxies Veeam should use. One very common user request that we have addressed with 9.5 is the option to assign a different protocol to the Veeam proxy server than the one being used by the VMware server. Before 9.5, you could use different REG-Keys to force the Veeam proxy to use a different protocol. 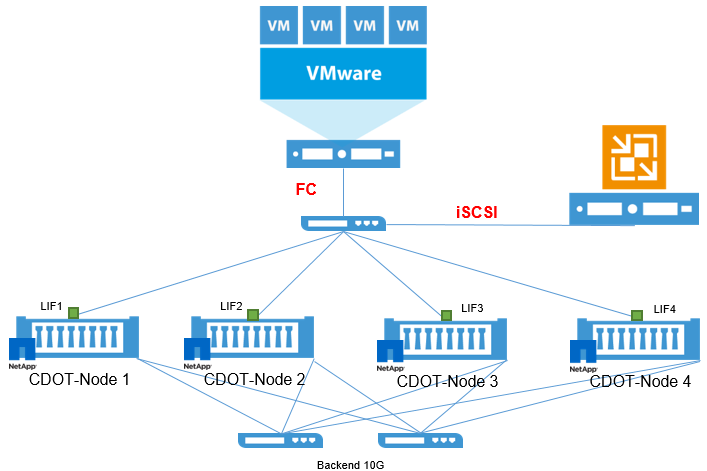 Now with 9.5, you can easily deploy a configuration where VMware is accessing the ONTAP cluster by FC, while the Veeam proxy uses iSCSI for backup and replication and all of the other Veeam features. Since the LUN is the same block device, it can be accessed via FC, iSCSI or both, enabling you to leverage your existing 10 GB network to back up the data via FC or iSCSI (or vice versa). Besides the benefit of defining a different access protocol, you can also reduce the time that the Veeam proxy needs to scan and access your NetApp data and start a job, as the overhead required to check all available protocols is eliminated. In short, it’s a very simple way to optimize your existing Veeam and NetApp installation. To configure the protocol selection, simply go to “Storage Infrastructure” within your Veeam Backup & Replication console and select the NetApp cluster you want to modify. Open the advanced settings and select the protocol to be used by the Veeam proxy host. As shown in the above example, only the licensed ONTAP protocol is available to use. In summary, the enterprise enhancements available in 9.5 make the Veeam integration with ONTAP more flexible and scalable. This is another great example of Veeam product development implementing feature enhancements based on the direct feedback from our customers and partners.